It was not easy last week saying our goodbyes to the refugee family, which left Connecticut on April 15th to live with a cousin who is part of a Congolese community in Grand Rapids, Michigan. The cousin has been in the US now for 7 years, lives in a large, multi-bedroom house, and has helped other refugee families to resettle in the Grand Rapids area. He himself was resettled by Bethany Christian Services, a refugee resettlement organization with an excellent reputation in the Grand Rapids area, and he continues to have active contact with Bethany. We are hopeful that Bethany Christian Services might be able to provide some support for the family, especially during the early weeks of the transition there. As you can imagine, the family has (another) very challenging transition in front of them. While they have expressed their appreciation for the support they have received from folks here in Connecticut since they moved here in November, they have told us they have been lonely, and that the attraction of living in a community with extended family and with a concentration of other African refugees in Grand Rapids is a powerful one. They have also expressed that it is extremely expensive to live in Connecticut, and they have been concerned that they would have trouble making ends meet in our area for the long term. IPRR, our interfaith group comprised of six faith communities, has thoroughly enjoyed getting to know the members of the family, and learned much along the way. The family has added so much to our lives and we will miss them a great deal! Our heartfelt prayers go with the family as enter the next phase of their resettlement journey as they put down roots in Grand Rapids, Michigan in the weeks and months ahead. IPRR met on Tuesday evening, April 18th at Trinity to share what we've learned and experienced together in our work with the family since November, and to talk about the future of IPRR, including a discussion of whether we see resettling another refugee family as part of our future. Stay tuned for more details! The family from the Congp, which has been supported by Trinity Church and the 5 other faith communities that together founded the Interfaith Partnership for Refugee Resettlement (IPRR), recently passed their 90-day anniversary since arriving in our country. Before arriving in Connecticut, the parents had fled from the Congo and had been living in a large refugee camp in Tanzania for 16 years, where all four of their children had been born and had lived their entire lives. Much has happened since the family first arrived at JFK airport on November 17th. They have been living in a beautiful apartment in Danbury, and working hard to learn English, and understanding life in Connecticut. Through the combined efforts of dozens and dozens of dedicated and caring volunteers from IPRR’s six Newtown faith communities (as well as other interested members of the Newtown and Danbury communities), the four children have gotten off to a terrific start in the Danbury public schools, they are learning how to navigate Danbury, and they are seeking to build relationships with their neighbors and members of the Trinity Tabernacle Church in Danbury, where they worship each week. The transition to a new country, a new culture, and a new language has not always been easy. They miss their friends back in Tanzania and interacting with others who speak their language and share their culture. In fact, they are currently considering a move to another location outside of Danbury – possibly outside of Connecticut – to become part of a Congolese community. Whether they stay in Danbury or relocate to another area, there is still much to do as we strive to help them reach their goal of self-sufficiency in the US. And whether they stay or relocate, we are grateful for the indelible mark their family has made on our group, as well as those in the Danbury community whom have come to know them. Please pray for the family (and for IPRR) as we continue to work together to explore what (and where) comes next in their journey ahead. Trinity’s inter-faith refugee resettlement ministry is delighted to announce that our application to help resettle a refugee family in the greater Newtown area in the coming months has been accepted by CT’s Integrated Refugee and Immigrant Services (IRIS). We start a full day orientation and training on either Aug 4th or a date early in September at IRIS’ office in New Haven. We’ve recruit chairperson volunteers for almost all 10 of our working committees as well as almost 50 additional volunteers from among our 5 faith communities. They are focused on locating housing, welcoming and orienting the refugee family, teaching English, coordinating transportation, providing health care support, and helping adults find jobs. In addition, our group (with your help) has been able to raise over $6,000 to help with rent, a security deposit and other expenses the family will face in the early months until they are able to sustain themselves. 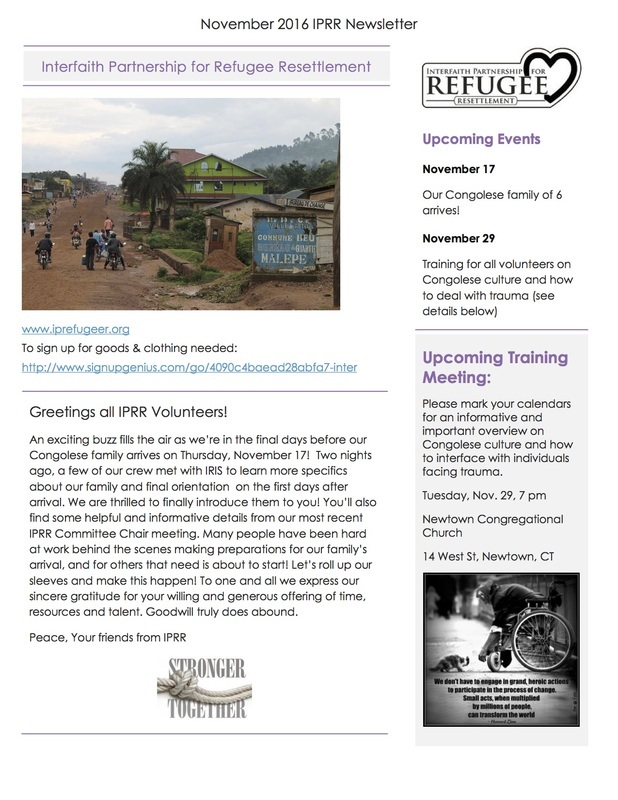 We invite you to actively support this new ministry at Trinity by remembering us regularly in your prayers, and considering our invitation to volunteer either as individuals or families as we seek to draw on our faith to help a refugee family begin a new life, regain hope and contribute to the vitality of the greater Newtown community!